The Ring: Preeti knew exactly what she wanted in an engagement ring and was very involved in the design from start to finish. 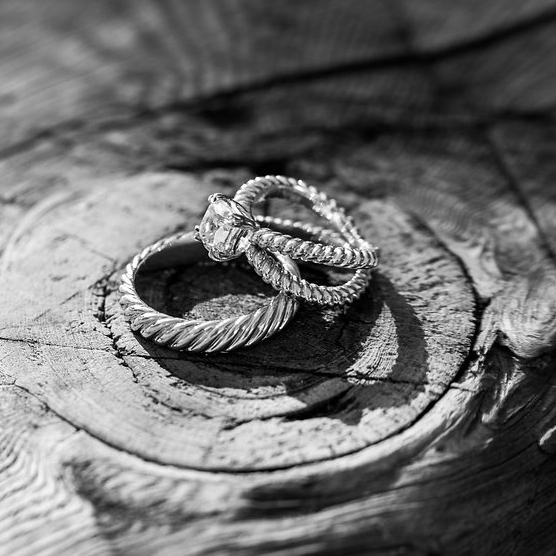 The couple picked out a beautiful 1.51 carat Cushion Cut diamond which was set in a meticulously tailored rope inspired ring in yellow gold. She wanted all the attention on her center stone, and did not allow for any diamonds on the ring to take away from that. She designed a similarly crafted ring for Ricky's wedding band. True to their Indian tradition, Ricky's family adorned their daughter-to-be in two diamond bangles with an astounding 12 carats of diamonds on each bangle, totaling to 24 carats for the pair. In honor of the bride and groom, the bangles have a hidden plate inside each one with the couple's names on it.